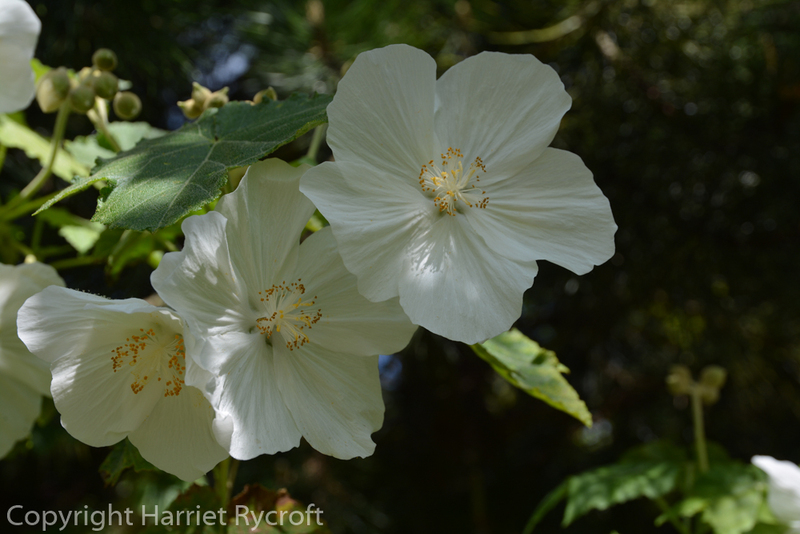 I struck a cutting from a friend’s Abutilon vitifolium var. album about ten years ago. 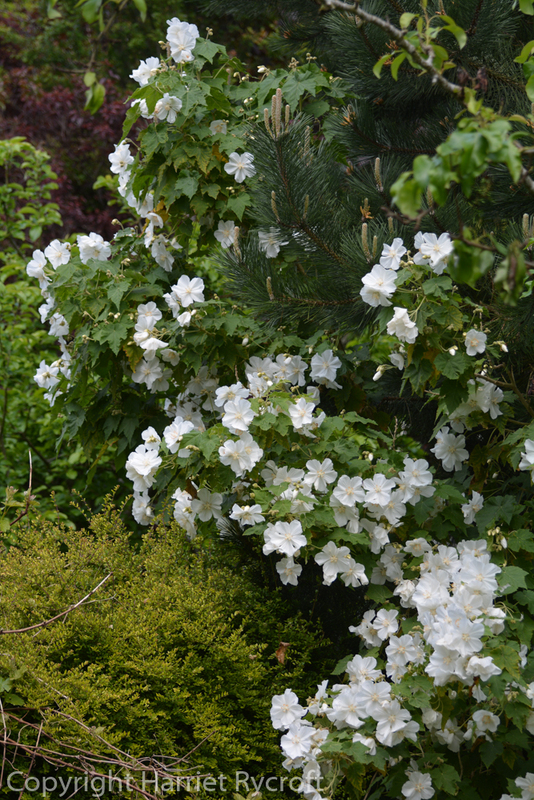 Once it was a decent size I planted it in the narrow border which runs down the left hand side of our garden. This border is full of weeds and rampant things like Lathyrus latifolius and an inherited vine, and is the border I keep meaning to sort out. But I never quite get that far. 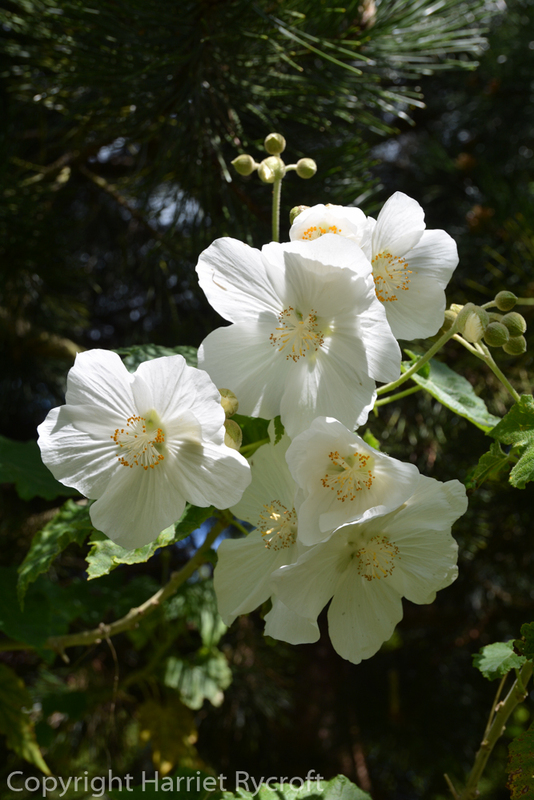 One year the Abutilon fell over and so it has a kink in its main stem from righting itself (because I never got round to supporting it). It has survived swirling winds, a Jack Russell terrier which used to dig its way into our garden just next to its roots, rampant bindweed (and those sweet peas), footballs, snow and rock-hard frosts. 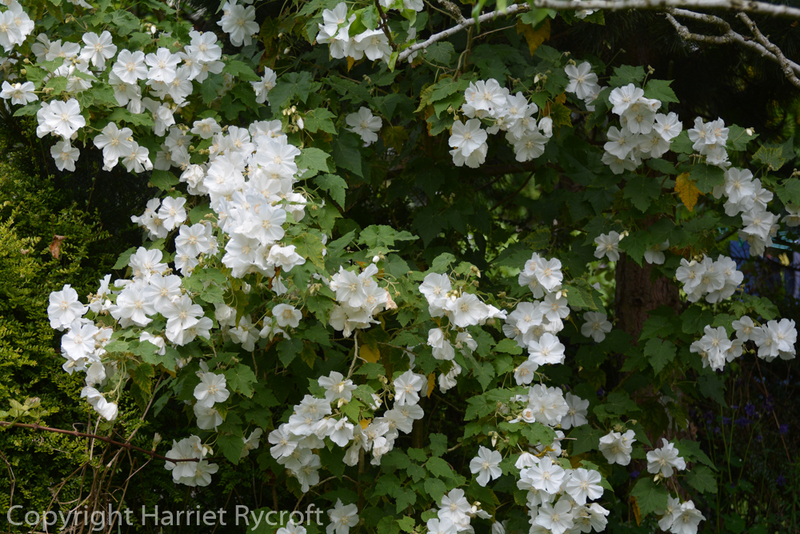 Every May-June it has politely produced a few snow white flowers and then fallen back asleep. Nobody really noticed it was there. Did I swear at it and threaten it with the chop last year? I forget. Anyway, this year it has gone berserk and has been flowering extravagantly for a couple of weeks already. It has also grown up into the branches of the neighbouring pine tree. I am hoping that this is a result of the mild winter and not a sign that it is about to snuff it. Because I haven’t got round to taking cuttings yet. Fantastic….!!! I do love that plant ….!!! A friend has given one to me last week , and I wonder if I’ll succeed as well as you did …..Congratulations…. what a truly beautiful specimen. I have the more more common mauve one in my San Francisco garden. it has sort of been biding its time for the last couple years, so I hope after it gets completely settled in it will mimic yours in structure.